To enforce participatory democracy in the EU, the European Citizens Initiative should be radically reformed and addressed to the EU Parliament, not the Commission. 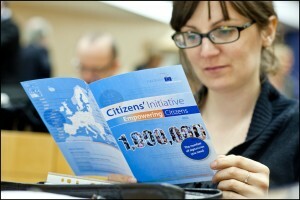 In 2013 I co-organised a European Citizens’ Initiative (ECI) on basic income. As I wrote here, experience with using this new EU democratic tool was shockingly painful and cumbersome. My frustration however led me to become member of the ECI Campaign, a 15 years-old non-profit which has fought hard to make the ECI exist in the first place, and is now fighting to make it more politically powerful and citizen-friendly. Thanks to this involvement, I have been closely monitoring all developments on the ECI since 2013. Recently, the European Commission has finally announced that it will push forward a proposal to reform the ECI to improve its functioning. As a first step, the EU Commission has launched a public consultation which allows anyone to contribute to the future changes of the ECI regulation. In addition to the many technical ways to improve the ECI, there is one particular point that I think is worth drawing people’s attention to. I think that the ECI should not be entirely managed by the European Commission. Instead I argue that ECIs should be addressed to the European Parliament. The ECI puts the EU Commission in an uncomfortable position, for example as judge and party when it comes to declaring legal admissibility of ECIs. Moreover, the fact that the ECI is not legally binding is also very problematic, because it gives the possibility for the European Commission to dismiss proposals very quickly after an ECI gathers millions of signatures. This unavoidably lead to incomprehension or anger from citizens. To be sure, it is obvious that not all ECI proposals should be automatically be adopted by the EU. But still, all successful ECIs should be given a chance to go through the EU institutions’ decision making process so that it creates a positive interaction between citizens and the institutions, instead of a perception of not being listened to. In other words, it much easier for ECI organisers to understand why their proposals are not being followed up with after several months of debates and parliamentary process rather than after a simple hearing and a single statement by the Commission. Once they have collected one million signatures, ECIs should be addressed to the European Parliament (EP). After giving a long hearing to ECI organisers, the relevant EP Committees would decide how to followup (resolutions, reports, proposals for legislation, etc, or nothing at all). After adoption by the European Parliament in plenary, then the EU Commission can make an appropriate judgement on whether it is relevant to followup on the EP’s recommendations, by using its usual competences and decision making processes. This way, the ECI would advantageously replace the EP’s petition instrument and create a more direct link between citizens and MEPs. Going through the EP would bring more legitimacy to ECI proposals, but also make those ECIs become more sensible and realistic policy proposals. On the long run, one could even imagine that successful ECIs would create an exception rule where the EP can actually have the right of legislative initiative in a similar fashion as “parliamentary windows” (“niches parlementaires” in French) which allows even minority parliamentary groups to initiate a limited number of bills per year. I believe such change would make the ECI politically more powerful, but also more relevant and coherent within the functioning of the EU. It would relieve the European Commission from an uncomfortable position and create a more positive experiences for citizens. My full response to the consultation is available here (pdf). Answers were made on behalf of myself, not the various organisations which I am involved with. You too can participate to the consultation by clicking here (it takes about 10mn).